Thank you so much for choosing us as your plumbing company! Mojica Plumbing & Drain Cleaning wouldn’t exist had it not been for our valuable and kind customers. Any small business relies on the loyalty and trust that its clients give them, and it’s no different for our Austin plumbing company. To show our gratefulness, we’re always working hard to put forth high-quality plumbing work for you and your home. We’ve been working in the plumbing industry for quite some time now, serving the cities and suburbs of Austin, Round Rock, West Lake Hills, Taylor, Georgetown, and even the small Circleville. As a way of saying thanks, we thought we’d discuss some of the things that our plumbers have been doing for our clients. Running water isn’t cheap. It depends on electricity to move and the water company to provide the water. That being said, not all plumbing appliances are created equally, and some are more efficient than others. Appliance companies and their engineers are moving towards innovation, which naturally means efficiency and sustainability. Newer faucets, toilets, water systems, and pipes are designed to use less overall water. Therefore, by installing them, you’ll be saving hundreds of dollars in electricity each year. Our plumbers are educated on the latest technology and how to install them correctly. It’s easier, and cheaper, for our company to only stay on top of what we have to know. Instead, we work to learn the “new” so that all of our clients have access to plumbing technology that’s efficient and chic—yes, plumbing can be chic! When you go to the doctor, you expect them to tend to any issue that they find immediately. Your life depends on it. If they find something negative on a test, they won’t ignore it and leave it for the next doctor to find because it’s too difficult to treat or because their workday is just about over. Plumbers should never do this either. A plumbing system is like a body. Like one illness could affect every organ, one leak or crack could affect the entire home. Whenever our plumber work on a home, even if it’s something as simple as drain cleaning, they look out for other more serious issues. If they notice something, they’ll always take immediate action. Our plumbers will inform the homeowner of the issue, the steps to take, and how they could offer help. Going off of the last bit: we expect people to be wary of our suggestions. You’d probably think “he came in to clean my drains and now I apparently I need an entire pipe installation.” It makes sense because that is something to fear, but it’s not something we’d ever do. Mojica Plumbing & Drain Cleaning is a family, and we don’t treat our clients like they’re a wallet. We wouldn’t want somebody to do that to us, so we’d never do it to them! Whenever we make suggestions, we always offer them because we believe it’s in your home’s best interest, not because it means a sale for us. Every company in the world boasts hard workers, but we mean it. It shows in every job that we do and how we handle our client relationships. Every house that we go to we treat like it’s our home. You rely on us to make sure that your home’s plumbing is functional and safe; we take that very, very seriously. We appreciate our clients, and we want to make sure that they appreciate us. As a result, we go into every home with the mindset that we’re going to get the job done right the first time around. We’ll never skimp on our work for the sake of time, and we’ll always go above and beyond what we’re expected to do. For example, when we replace a leaking pipe, we’ll go through and make sure none of the surrounding pipes are cracked or maimed. Our plumbers are never rushed to get the job done fast. Okay, well, maybe there are some things that we can’t do, but when it comes to home plumbing, we can do a lot. We can also do a little. When we do work like drain cleaning or simple pipe fixes, we’re not making a huge profit. Yet, we treat it as highly as we would an entire pipe installation. For our plumbers, no job is too big and no job is too small. If you need our help, we’ll do our best to provide the best service possible. It’s just what we do! 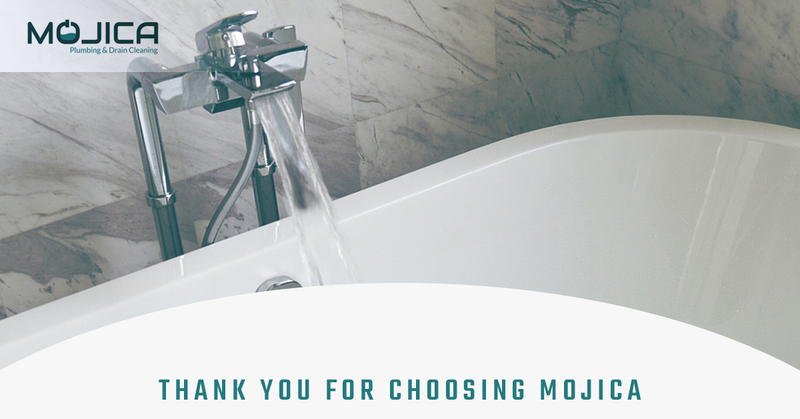 Thanks again, homes of Austin and surrounding towns, for choosing Mojica! For plumbing services, please give us a call today!